Adventure #16: Labyrinth Loop – Hi, Alpine. “What do you want to do?” Robin inquired. Such indecisive conversations are not usually had the night before we hike. 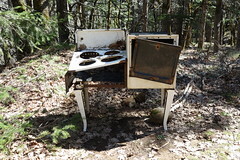 Most typically, our target location is set days in advance and the evening is full of prep activities such as chopping sausage and cheese chunks for the hiking lunch, finding matches to woolen socks, or sneaking handfuls of the new trail mix. But last night we were indecisive, perhaps due to both having survived two particularly intense weeks at work. Today we needed a mini-adventure, and it turned out lovely. We woke up at 9:00, futzing around the house while enjoying coffee and playing Jello Biafra and Mojo Nixon’s “Prairie Home Invasion” while Robin wrote down directions to the trailhead. On today’s menu: a little 7 mile low-elevation recliner hike leaving from the Coyote Wall Trailhead and looping around The Labyrinth. After heading out the door at 11 (uncommonly late for us! ), stopping for some deli, and filling up the tank, we finally rolled into the parking lot around 1:00. It was packed, with several cars parked illegally on the entrance road and along SR14’s ditch. With one of the first warm, sunny days of spring happening we expected some crowds, but this was beyond our suspicions. This was a true horde, but with some incredible luck we managed to nab a parking spot from some wise person who had risen early and gotten there before the onslaught. Robin had read that the trail network was vast and had the ability to swallow many visitors, and this turned out to be true. From the parking lot, the “trail” heads up what used to be the old Washington Hwy 8, now sun-bleached, buckled, and cratered with rocks that plummeted from the sharp wall to its north side. 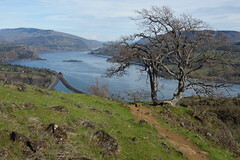 About .75 miles along this road, we took the second trail and headed away from the railroad tracks lining the Columbia River and began the climb up into the grassy, rocky hills. Almost immediately the area’s unique geography revealed itself. Giant columnar rock faces jutted up from the gently sloping hills, with lines so straight they looked almost artificially manufactured. The trail worked its way uphill along Catherine Creek and the oak groves it feeds, and even this early in the season was lined with buttercups and a white flowering shrub whose name is unknown to me. Despite spring showing itself in the first wildflower blooms and new maple leaves, the oak trees remained mostly naked except for the shiny red starts of new leaves. The poison oak, however, was looking luxuriant, oily, and very pleased to be alive. If one forgets for a moment the kind of discomfort it can inflict, it really is a very handsome plant. Up, up, up the trail went, getting progressively more beautiful with every rise in elevation. Tiny white flowers carpeted the fields, and soon we found clumps of bright yellow balsamroot in full bloom. The lupine was getting ready, too, but was lagging a bit behind and all I saw were some fuzzy heads where the flowering stalks will be in a few weeks. The view from the top of the ridge was beyond our expectations. The Columbia stretched out to the east far enough to see where it disappeared into the arid eastern Oregon and Washington deserts. The hills were so green and seemed right out of The Sound of Music (pretty sure I caught Robin twirling) ,and sloped down to the river where a massive, snowy Mt. Hood was always in view. Robin, it should be noted, is in love with Mt. Hood, and was insatiable with the views. If you, too, are filled with a strange kind of passion for that snowy peak, know that this trail will keep you very satisfied while waiting for its slopes to melt enough to go on its own hiking expeditions. 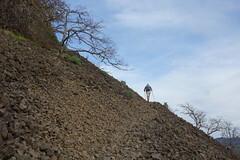 Looping back over the upper ridge, the trail came out at the top of the Coyote Wall, the enormous cliff face beneath which we had parked. We hoofed it up to the top of the wall, got some vertigo, then clambered back down the 1.6 miles along the wall’s edge, back downhill to the main road. The last stretch of trail was unique from the rest of the terrain with several shrubby pine trees and horizontal rock strata, and we were so happy with how many different types of scenery this trail had produced in relatively few miles. The Coyote Wall/Labyrinth Loop is a highly recommended trail, one we are sure we’ll visit again when the oak trees are fully leafed out to offer some sun protection and a different take on the scenery. The gentle elevation gain (under 2,000 ft) and low mileage make this a great venture between bigger outings. Two downsides: first, the highway/train noise is constant, so the sense of escapism doesn’t come as completely with this area, and second, the trail network is a bit crazy due to all the mountain biking, and we ran into a couple parties of people who seemed lost. Go prepared with a map and water! Trail information and directions courtesy of the Washington Trails Association. Robin’s own trip report can be found here.